NOT EVERY CONCEPT CAR IS A GOOD IDEA by Jim Corbran, Automotive Columnist I first saw mention of this 2015 Jeep Chief concept car last week in the Automotive News Cars & Concepts newsletter, and when I was done reading I searched in vain for an April Fool’s Day announcement, even though I knew it was June. This is hideous! So from there I surfed on over to the FCA (Fiat Chrysler Automobiles) Media page to see if I could find any official mention of this thing, and there it was: “A tribute to the classic 1970s era full-size Jeep Cherokee, this Wrangler-based concept vehicle evokes the west coast surfer lifestyle of sun and fun with a nod to nostalgic beach rides.” To me it evokes an old 1970s International-Harvester Scout II to which someone has grafted the grille and taillights from an equally-old 1970s Jeep Cherokee. Whether they fit or not. I’ll say this much: it is refreshing to see chrome bumpers again; the 1970’s style slotted chrome wheels are a nice nostalgic touch; and who couldn’t love pink, blue, and white flowered cloth and leather-trimmed seats? I say, send this thing back to the drawing board. Nostalgic car designs may be in again, but there are limits. 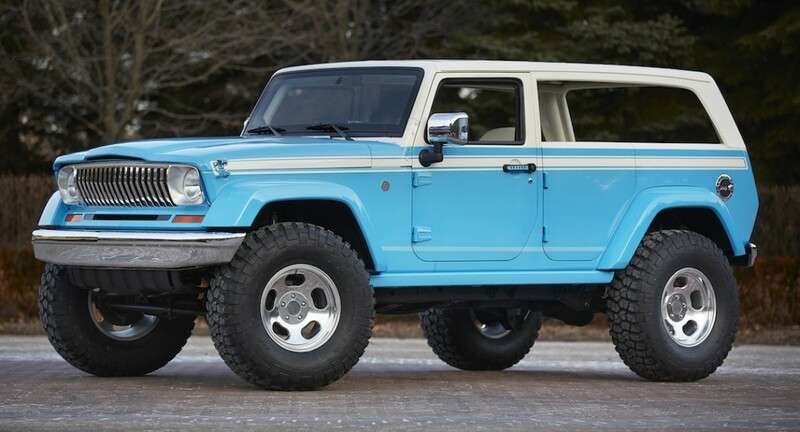 more info at: http://www.autonews.com/article/20150609/BLOG06/150609875/lifting-the-curtain-on-the-jeep-grand-wagoneer?cciid=email-autonews-&profile=1657 ### The post NOT EVERY CONCEPT CAR IS A GOOD IDEA appeared first on Buffalo Cars.